Can anyone give me a Lat-Long for the Davo Jones Memorial Plaque on the Horrocks Pass road please. Pan left and you are very close, should be a small marker on the fence. I got the info. from www.FarRiders.com.au website. West out of Wilmington toward Port Augusta through Horrocks Pass. Then further along a couple of k's further you will see "BIG" powerlines across the road. There is also a white stencil with AFR on it on the white hard shoulder line. I seem to remember a white rag tied to the fence to make the location easier to see from the road but that was before the little bit of wind we had a few weeks back. Thanks for the info. I found it once a while ago, and recently crawled up and down the road but did not spot it. I take it that it is the white raised piece of cement with dark metal (plaque) in the google maps attachments. I've looked out for it myself - without success, but now I have a better idea, thanks. Its placed somewhat discreetly against the fence line. many of the locals keep a good eye out for it and keep it sake for us too. 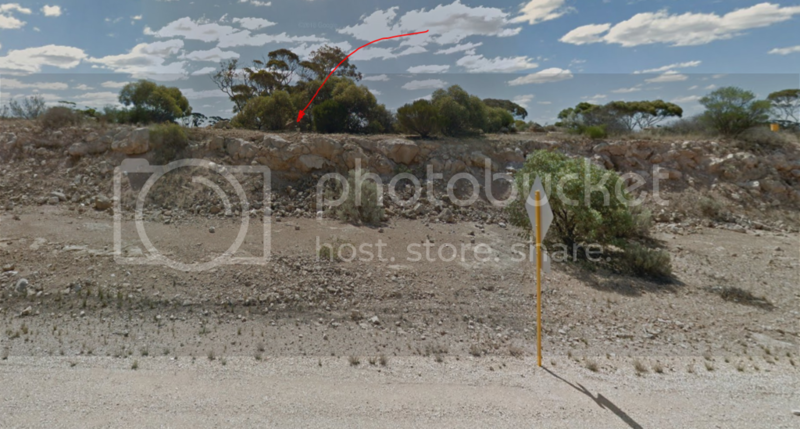 Can I suggest that you look at all the relevant material for this plaque site and the one in the cliff face/ cutting parking area at Madura Pass placed there the WA crew from back in the day. Its good to get the feel and spiritual placement of both these locations. With some time to digest the info and indulge in the meaning of the places, you'll find each plaque and find your quest a valid success. I'm really glad your looking into this StinkyPete. Its all part of an interesting and at times turbulent history of one man. Good luck with your search mate. Currently there are two bits of white ribbon tied to the top wire each side of the plaque. I will be visiting Davo's memorial this coming Friday, but not on the bike. We will be in the ute on a camping trip with family to the southern Flinders Ranges. Well we won't be wanting a Banner Shot then. Good time of the year for a camping trip. I'd like to explore the Flinders Ranges one day- maybe you can give us some pix and a Dtve Report. We enjoyed the Barossa last week. Gatey, can you please provide a location of the plaque at Madura Pass. I've found a photo of the little plaque itself, but the actual location remains a mystery. Next time I'm passing through, I'd like to visit and honor his memory. As I recall, you turn left in the carpark. When I was there the dirt surface was very uneven due to wheel-tracks in mud which had dried. I'm pretty sure it's directly adjacent to an orange "Left Lane Ends" sign. See Streetview. I will post up a pic when I get home. Coming up from roadhouse turn right into airport road then immediately right into carpark and in right hand corner is a small rock memorial....paint your number on a rock and leave it in the surrounding pile. I'm looking foreard to seeing Davo's simple memorial at Madura Pass, and leaving my FR and IBA number on a rock which I'll carry with me on my OzLap. Have a good read of the FarRider info re the Madura Pass memorial because it's not as easy to locate as the Horrocks Straight one. Here is a photo from the dirt carpark looking over the highway. You can see the road sign that is in LindsayGT's photo. Someone has also placed a couple of rocks on the boulder which is near the memorial rock. It is difficult to find as the memorial faces the road and cannot be seen from the carpark. You need to walk along the edge of the drop off and look back towards the carpark to find it (don't fall off the cliff). Both the Madura and Horricks memorials are both worth the effort and the perfect place for some reflection.